The last day of September and Great Dixter (http://www.greatdixter.co.uk) is still comfortably pumping out rushes of sheer happiness all over the garden. I am part of a monthly study group led by the tirelessly enthusiastic Kemal Mehdi – friend of the late Christopher Lloyd and Dixter Trustee. It is always the same – as we turn the corner from the Front Meadow and get the first dancing glimpse of the Barn Garden beyond the dark yew entrance – no one can help that moony Dixter smile wash over their faces. The rest of the world stops for a day as we get looking, hungrily. This wonderful – tender – sage has tall spires of glowing crimson flowers on soft, felted calyces with bold corrugated green leaves. 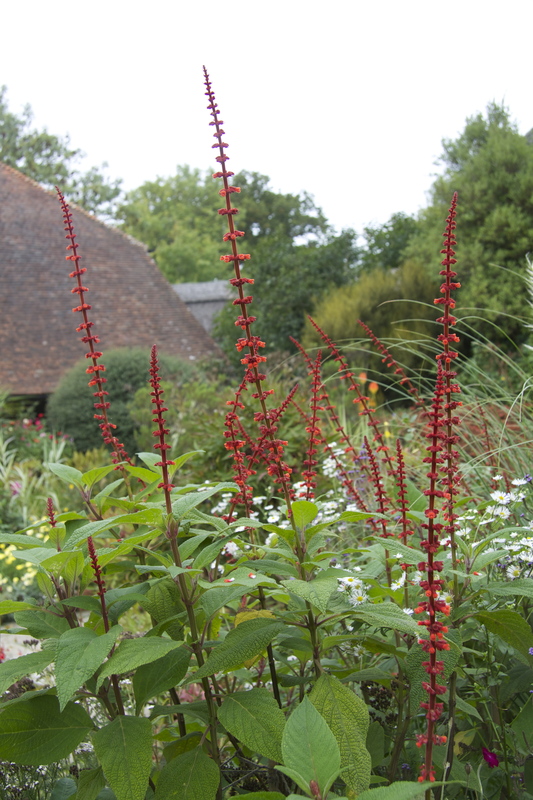 It has the perfect common name – ‘red velvet sage’ – and is dangerously irrisistable here against the rich reddish brown of the wonderful barn roof tiles. The daisy in the background here is the tall Erigeron annuus which is one of the late summer leitmotiv plants at Dixter. It works especially well when used lightly as it can look a bit marooned and leggy when there is too much of it in one go. The elegant arching foliage belongs to the compact and surprisingly elegant pampass grass – Cortaderia selloana ‘Pumilla’. Time to throw out all prejudice about pampass grass perhaps and enjoy instead the elegant, slender evergreen foliage and soft white upright plumes? 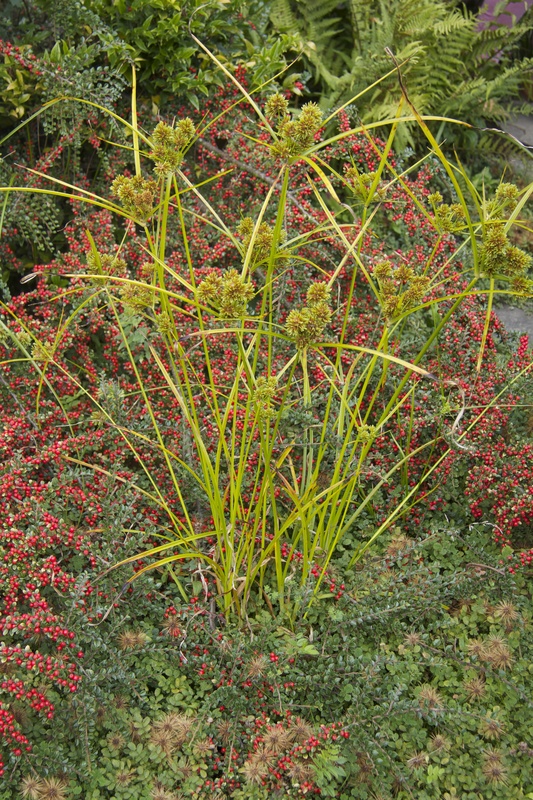 Growing near the pond at the centre of the Barn Garden – but introducing itself with style up the steps and into the barn itself – the yellow greens and bronzes of this supposed bog sedge glow vividly against the brilliant red of Cotoneaster horizantalis behind it. 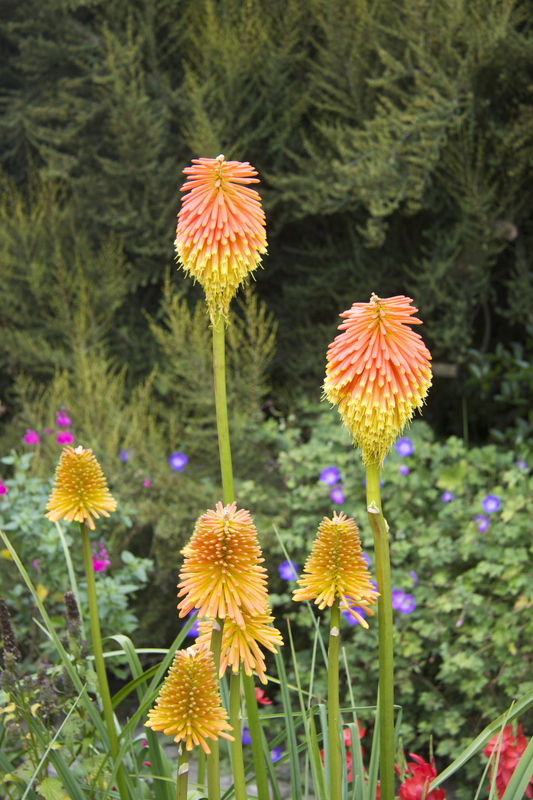 At the top of the steps is a stand of fantastically robust and brilliantly coloured red hot pokers. Evergreen architectural foliage and a reliable offering of orange-red torches every October. All this against irridescent dashes of magenta – the incredibly long flowering Salvia microphylla ‘Cerro Potosi’, the rich purply blue of even longer flowering Geranium ‘Rozanne’ and the intense coral red of Hesperantha coccinea Major (Hesperantha the new name for Schizostylis). Every member of the happy club muttering quietly to themselves already. For really trying to understand the impact of certain plants and how they work together there is nothing to compare with looking closely at any garden again and again throughout the year. 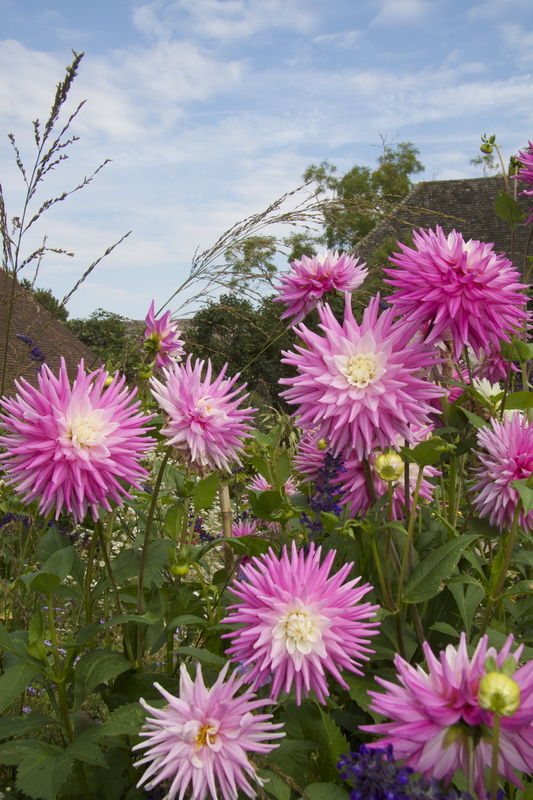 At Dixter – famous for a density of successional planting that few other gardens could even begin to emulate – visiting and revisiting is relentlessly rewarding. What is even more energising is the tone of happy and constant experimentation that Head Gardener, Fergus Garrett now sets for his wonderful team. There are many moments at Dixter that are beyond the manpower and skill of most gardens but there are also plenty of ideas that will work really effectively elsewhere. Taking the time to track down a particular variety and then giving it space and growing it well. 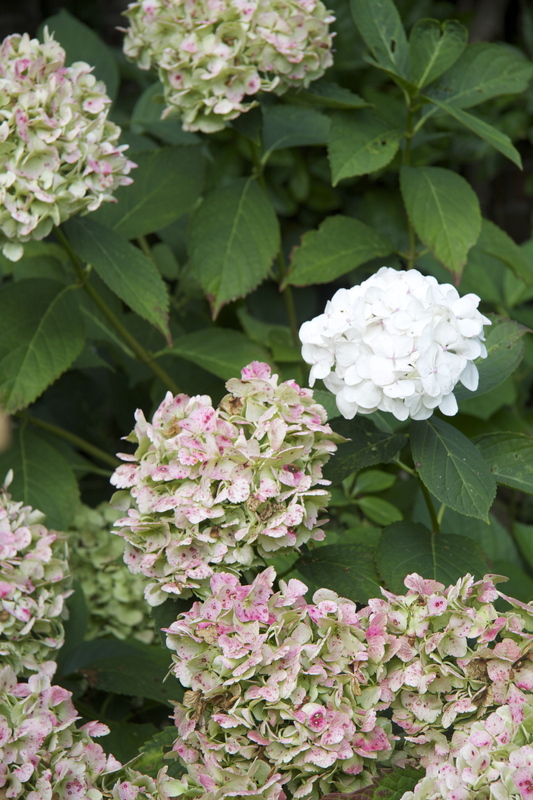 Christopher Lloyd always declared this to be the best pure white mophead hydrangea – a clear white rounded flower head with faint pink markings which gradually fade to a soft speckled pale greeny- pink. It needs to be given space away from brighter more magenta toned pinks or it will appear to be almost salmony in colour which might irritate – well it would irritate me. 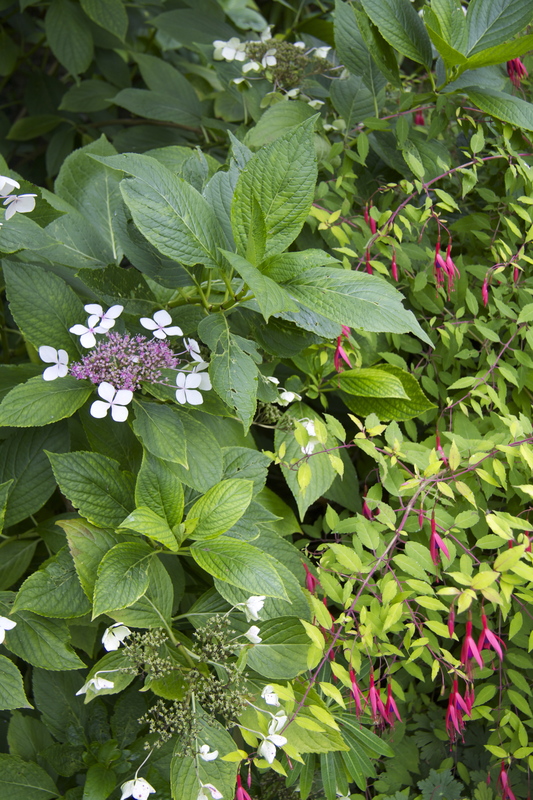 On its own or amongst green foliage, this late summer colour is gorgeously subtle and happy to be occasionally illuminated by the occasional freshly emergent white flowerhead. Looking through a stepped yew arch from the High Garden down into the orchard garden a group of Actaea simplex are planted, brilliantly, by themselves. 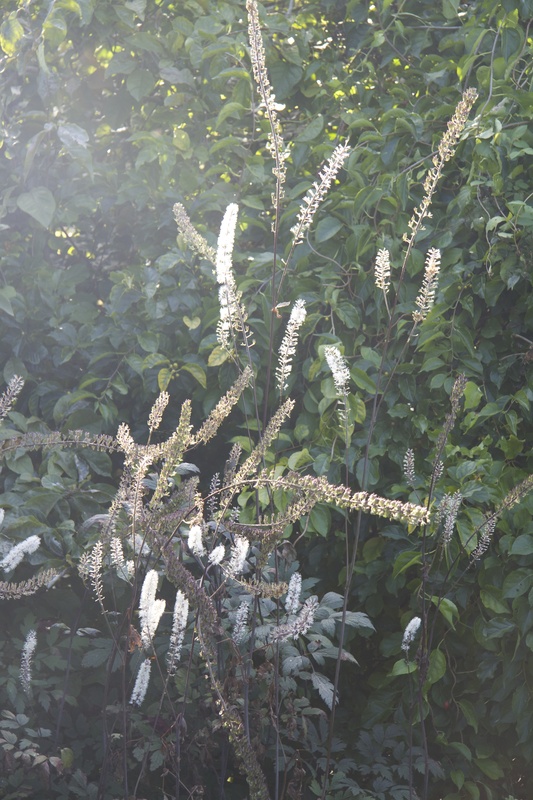 The slender white bottle brush flowerheads catch the early evening sun – dancing afternoon fireworks leaning and fizzing in every direction. 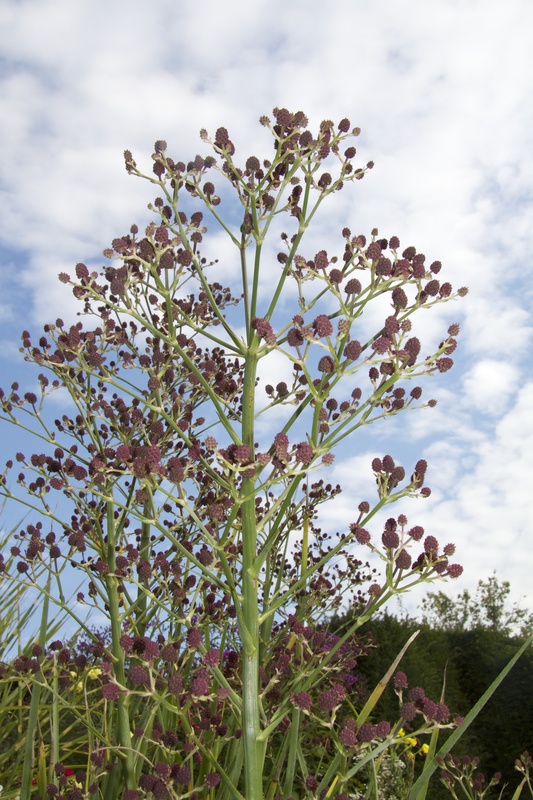 Well admittedly this monumental plant – situated at the bench end of the Long Border is hardly on its own – but it is a fantastic year round architectural presence with a rosette stiff grey green leaves and wonderful towering – 6 or 7 feet high – branched heads of tight wine coloured flowers from October to December. I am on a mission to find a place for this plant. 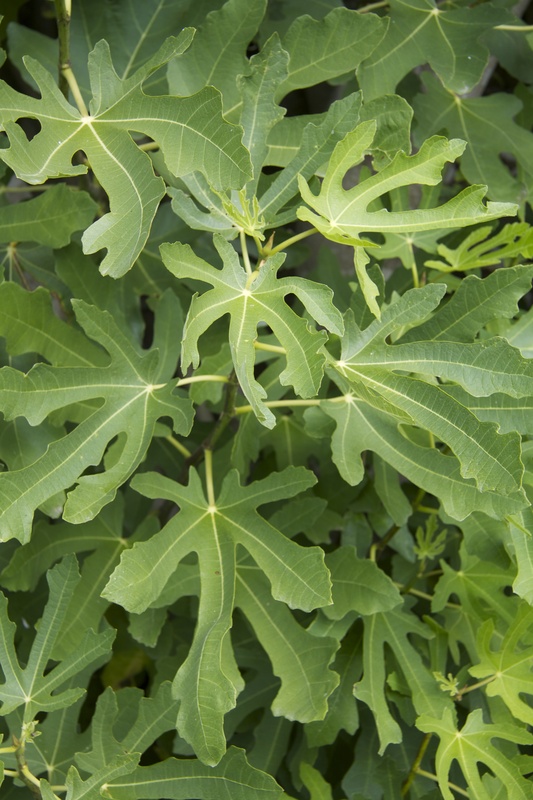 A wonderful fig grown against the South facing wall on the Lower Terrace. Worth stopping to admire the rhythmic patterns formed by the overlapping deeply cut leaves. Even better to discover it is a reliable and heavy fruiting fig in the UK with greeny-yellow skinned fruit with sweet tasting pink flesh. Cotoneaster horizontalis is hardly a fashionable plant but is used brilliantly at Great Dixter – clothing the base of walls and flights of steps with its dynamic fans of branches, tiny glossy green leaves and at this time of the year generous beading of glossy red berries. 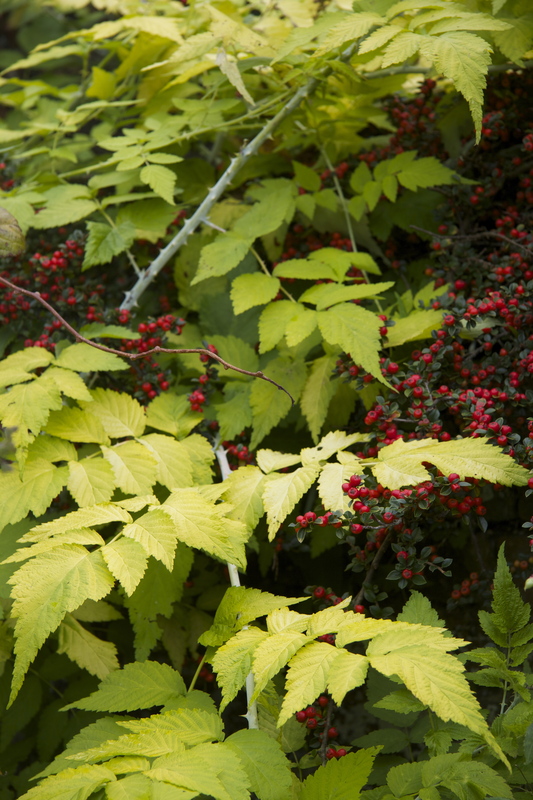 Here in the Walled Garden, the combination with the lime green leaves and chalky white stems of the white stemmed bramble, Rubus cockburnianus ‘Goldenvale’ is exquisite. Not an earth shattering combination but easy to recreate – the rich colour of the Cosmos and the airy texture of the grass working so well together. An absolutely classic combination of Hydrangea and Fuchsia – one of my favourite pairings which lasts so well in late summer through to autumn. 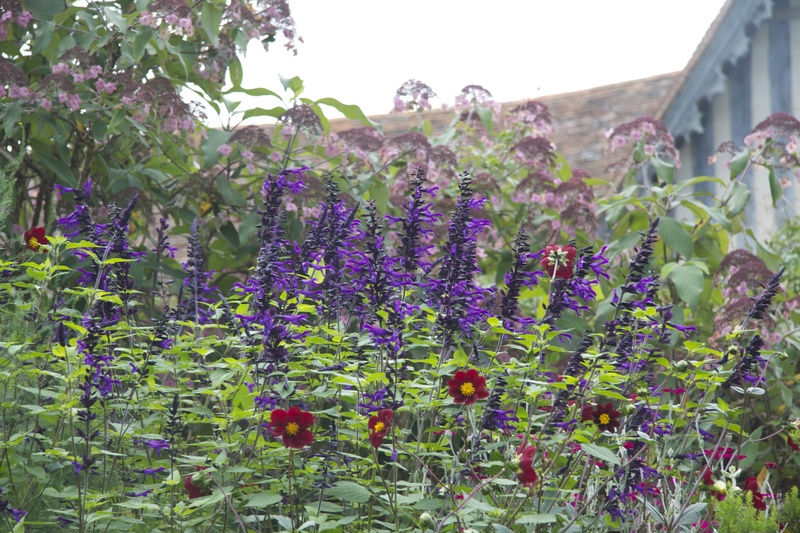 Great Dixter is brilliant at bringing a person round to certain types of plant. I have always been slightly reluctant to pick golden leaved forms of any plant, but as with the Rubus this Fuchsia is the best of its kind with yellow green leaves veined in beetroot with dark red stems and fantastically desirable glowing pink pendant flowers. The comparatively rare Himalayan woodland perennial, Paris polyphylla has elegant layers of leaves and fine whiskery petals on upright stems. 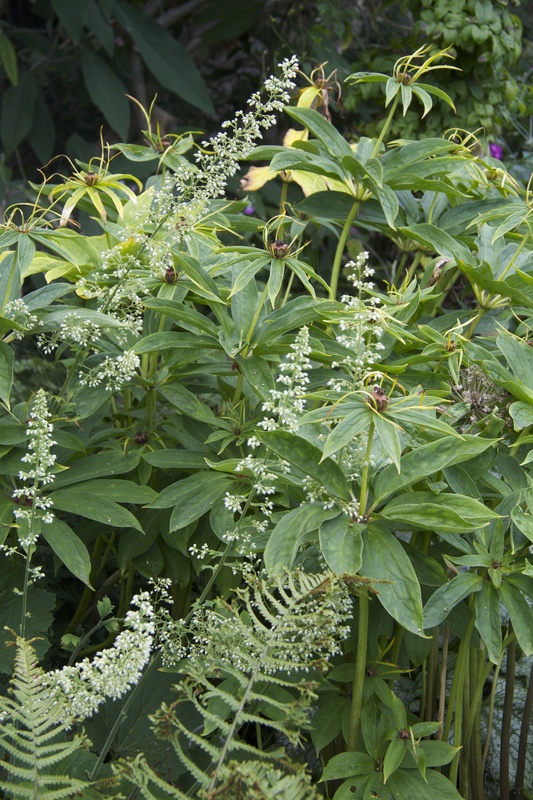 Even before the arrival of the wonderful surprise of the bright orange seed heads that is yet to come, this combination with the graceful Heuchara with its spires of tiny greenish white is graceful and covetable. 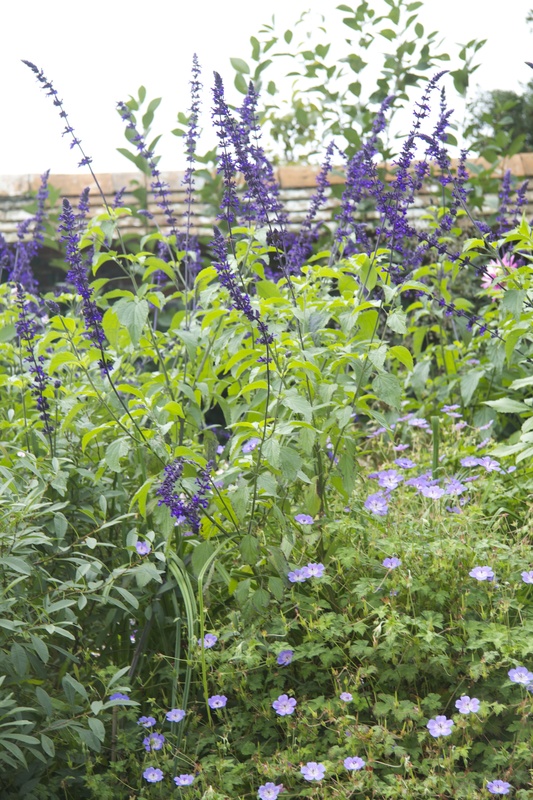 The elegant violet blue spires of the Salvia in a gentle combination with the paler blue of the Geranium billowing beneath. The depth of red in the Cosmos x Dahlia ‘Mexican Black’ brings out the richness of the the Salvia – a very different, velvety effect. Suddenly a more playful, sweet shop effect with the clear pink and white of the Dahlia energising the colour of the darker Salvia. AND FINALLY THERE ARE THE ALMOST PSYCHEDELIC DIXTER MOMENTS WHICH MAKE VISITING THE GARDEN SO UNSTOPPABLY JOYFUL. I am finding this Salvia dangerously enticing. There is something about the glowing purple of the flower, the black-purple of the calyces and the horizontal spread of the bright green leaves that creates a particularly tantalising, slightly drunken, fluttering tapestry. 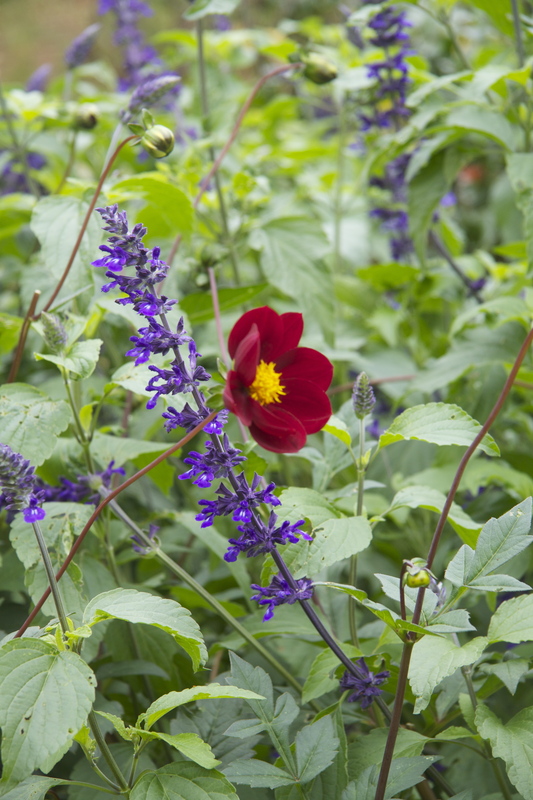 The rich red of the Dahlia x Cosmos and the way the flower heads pop up and look out in every direction like dainty periscopes adds to the dancing mood and then the laid back softness of the Hydrangea adds a smokey haze which deepens the mood. 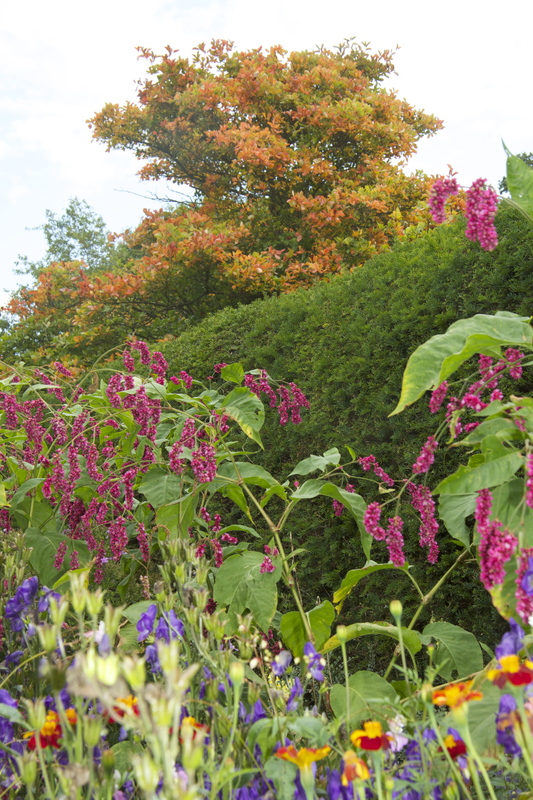 Persicaria orientalis, Amaranthus ‘Autumn Palette’, Aster thompsonii Canna ‘Phasion’, Aster laterifolius var. 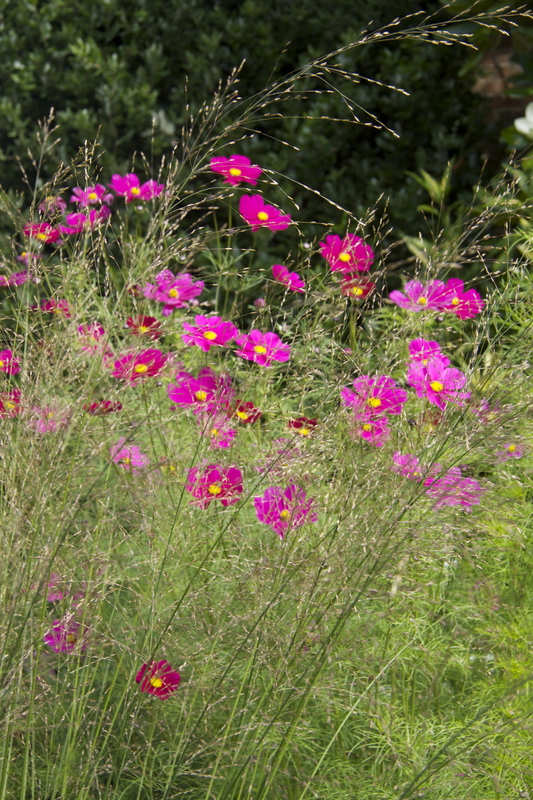 horizontalis – plus a white Cosmos and an orange Crocosmia. This is an amazing combination. The Amaranthus is completely wild – outrageous cinnamon suede flower heads and completely mismatching jack-and- the-beanstalk fresh green leaves. 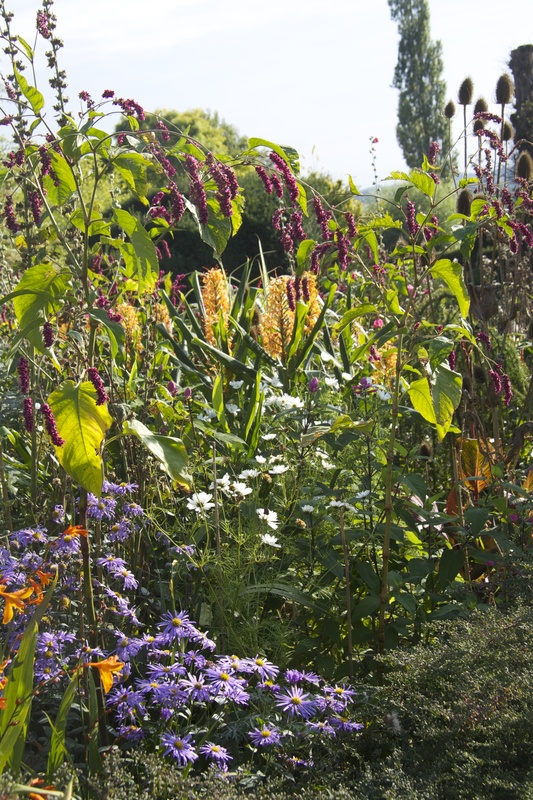 The bright pink arcs of the Persicaria orientalis – which are repeated wonderfully all over the garden – frame the scene which is enriched with the soft mauve of the aster, the crazy stripiness of the Canna (the RHS description of the Canna reads “bronze-purple leaves striped with pink, ageing to shades of pink and orange and large deep orange flowers in summer) and dashes of white cosmos and orange crocosmia complete this utterly celebratory planting. Crateagus persimilis ‘Prunifolia’is a wonderful hawthorn with glossy leaves, white flowers and deep red fruits. Known for its dramatic autumn colour it is worth noting just how early and how vivd this colour is. The Aconitum is vivid and compelling (at Dixter apparently Aconitum is divided pretty much every year to maintain this kind of flower power) and the stripy red and gold of the marigold keeps the energy going – as ever the broad stretch of flat green provided by the yew pulls everything together. At the beginning of the Lower Terrace there is a stone trough which always has something pretty seductive going on. 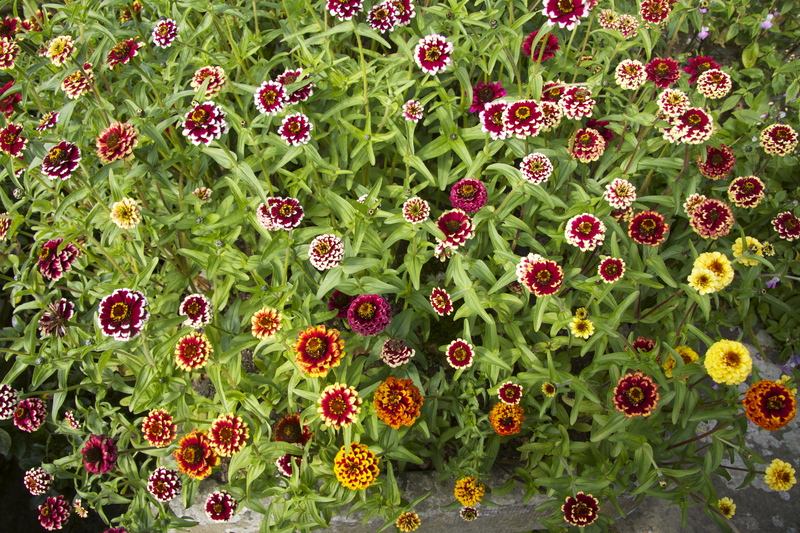 At the end of September the trough is bursting with these neatly kaleidoscopic Zinnia – so cheerily stripy and circular that you can only smile and persuade yourself that every additional moment like this is worth going for. 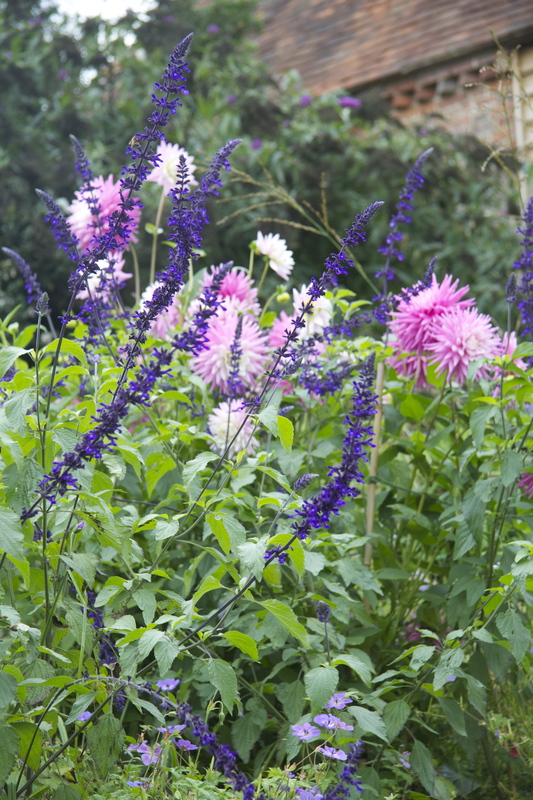 This entry was posted in Gardens and tagged Actaea simplex, Cotoneaster horizontalis, Dahlia, Eyrngium pandanifolium, Fergus Garrett, Great Dixter, Hydrangea Mme Emile Mouillere, Kniphofia rooperi, Salvia confertiflora, September on October 11, 2013 by nonmorris.